The West End of Newcastle has for years, been a place of constant flux. In the last century the economic climate of the area has changed dramatically, from a booming industrial zone at the beginning of the 20th Century, to the decline and unemployment of post war years stretching through to present day. At the same time, the urban landscape has fluctuated and shifted-from slum clearances to mass council housing projects, privatisation schemes to high-rise tower block developments, interspersed with large-scale demolition, dispersal and ‘regeneration’ schemes. However, amongst all the changes, one thing is certain- the area has a rich history of people coming together, forming strong roots, identities and community structures. The area is best known for the huge Armstrong’s engineering works, first set up in 1847 at Elswick, and eventually extending some three miles along the riverfront. However the area had an important industrial history prior to this. The availability of coal and the river attracted key industries such as glass, iron and lead manufacture as well as glue works, brick makers, paper factories and others. This is why most of the big houses and mansions were higher up the slopes, away from the noise and dirt of the riverside industry. The Elswick Works originally built hydraulic machinery, but soon branched out into manufacturing bridges and then into armaments. The company grew rapidly, and in 1866 Armstrong’s came to an agreement with the shipbuilders Michells of Walker to develop naval work jointly, and later the two companies merged. In 1884 a shipyard was opened at the Elswick site concentrating mainly on building warships. The works now had the capacity to build and equip an entire warship from raw material to finished product. Armstrong’s became the most successful exporter of warships in the world. Customers included Austro-Hungary, Japan, China, Argentina, Chile, Brazil, Norway, Portugal, Spain, Italy and Turkey, as well as Britain. The Elswick Works now occupied 50 acres. It was at one time the biggest employer in Newcastle. By 1863, 3,800 people worked there, and by 1895 it employed 11,000. When there was a full order book, the workforce sometimes rose to 13,000. In 1899 Armstrong built a second armaments works at Scotswood. One of its main products was locomotives. Armstrong’s factories now dominated the riverfront, and also dominated employment locally. A variety of other industries. also ran along the banks of the Tyne, making the river inaccessible to local residents. By the mid-19th century Tyneside was in the throes of an industrial revolution. The growing industries needed workers, and they came in their thousands – from nearby rural areas and from Ireland, Cornwall and other places further afield. The population of Tyneside grew tenfold during the 19th century. The west end of Newcastle became a boom town. The population of Elswick increased from 3,500 to 59,000 between 1851 and 1901, while Benwell’s grew from 1,272 to 18,512 during the same fifty year period. 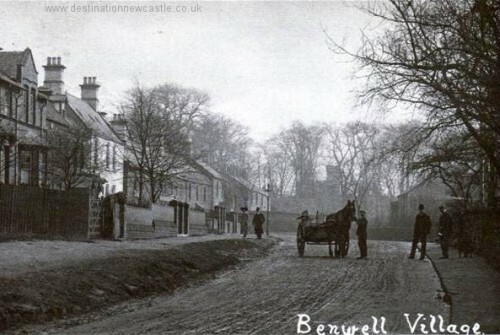 The second half of the 19th century saw thousands of new homes spring up across Benwell. By the start of the 20th century, most of South Benwell between Adelaide Terrace and the river was filled up with long rows of terraced housing, and residential development was rapidly extending across the northern part of the area also creating the densely built-up neighbourhoods of High Cross and North Benwell. These homes were for the ordinary working people who were needed to keep the factories and mines going, and also for the growing mass of white-collar workers who staffed the city’s burgeoning commercial and retail industries. The new housing was of variable quality. In general, the poorest housing was to be found lower down the banks near the factories, and the better quality homes were higher up. This period also saw an exodus of the rich families from their big houses and mansions, bound for more peaceful rural areas away from the encroaching urbanisation.